Contribute $10 dollars and we will send you one sticker, greeting card or postcard of your choice featuring PB&J art drawn by your friendly mod Ladama! Every additional 5 dollars you donate, we will add another item. As of 8/21 we have reach our goal! Thank you all so much! If you want to help us get a head start on next years costs, we are still accepting contributions and will send gifts to those who contribute $10+. and everyone who has purchased from Ladama’s RedBubble shop! contribute today and see your name here! – Enter your contribution amount, and in the “write a note” area, please include your shipping address and which items you want (the available items and their item numbers are pictured below). Also please include your MTT username! – Help us avoid fees and ensure your entire donation goes to MTT by electing to use your bank account or Paypal balance when you donate! – you can also contribute on our Ko-fi page which also allows a Paypal guest checkout. Here are the items available! There are 25 drawings/variants and you can select a greeting card, postcard or sticker. Print quality on the cards is very nice, like mini prints! Stickers are made of vinyl and the print is water resistant. The colors do come out a bit saturated, especially oranges and reds. Please keep this in mind when selecting items! When you send your contribution, please include the item number(s) and item type (G=greeting card, P=postcard, S=sticker) you want! Ex: You decide to donate $15 so you can get 2 items. You want a sticker of Two-Headed Michael and a greeting card of Christmas Pam & Jim, so you enter “8-S” and “10-G” in your note when you contribute. Want a closer look at the artwork or are interesting in prints/cases/totes/etc? 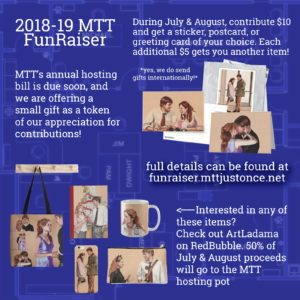 You can check out Ladama’s RedBubble shop and don’t forget, 50% of her July & August RedBubble sales will go to the MTT hosting pot!. – Where are these stickers/cards made? Are they good quality? They are from RedBubble, and yes they are good quality! – I don’t live in the US, can I still contribute and receive gifts? If you can use Paypal, you can contribute, and we will send gifts wherever a USPS international stamp will let us! – Is there any difference between donating with a bank account vs. a credit/debit card? Just a reminder, you can use Paypal without signing up for an account, but if you’d prefer to not use PayPal at all, send us a message and we’ll work on sorting out an alternative way for you to contribute. – Okay, I donated, when can I expect my items? It all depends on what your preferred item is, where you are, and when Ladama makes it to the post office ;-), so we estimate somewhere around 2-4 weeks. We will email you when your items are sent out. – Can I send $10 now for one item and then $10 later for 2 more items? – I want to contribute but can’t swing $10. Hey, every little bit helps! You can follow the contribution steps above and send any amount via Paypal. Only contributions of $10+ are eligible for a gift, but we will make sure to thank everyone who can donate any amount! – How long is this promotion going on? This promotion will go until the end of August. – What else you do have in your RedBubble shop? Lots of great stuff! And 50% of July and August proceeds will go to the MTT hosting pot so please check it out! – How do I know my donation is going to your hosting and not to magic lessons or WUPHF.com shares? We give our word that every cent we receive will go to MTT, but for extra piece of mind you can contribute via this link and your contribution (minus processing fees) will go straight to DreamHost. This method will also give you the option of paying without a Paypal account. – I don’t need the gift, just happy to help! – Will you refund donations? If you sent your donation to us (at MTT.Fanfic@gmail.com) we will refund your donation less Paypal fees and/or gift cost (if your gift was already sent) up to 10 days after you donated. Donation sent directly to Dreamhost cannot be refunded. – What with you do with funds if you exceed your goal? 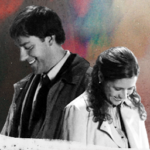 The goal of our fundraiser is to cover everything we need to stay online and keep the site ad-free and enjoyable for all Office and Jim&Pam fans! We mods do sometimes encounter other miscellaneous site-related costs through the year so if we are fortunate enough to exceed our funding goal, we may use some of these excess funds to help offset these costs, but most will go towards next year’s site costs. Either way every cent received goes towards keeping MTT online safe and thriving! Reply to this post or email your fundraising questions to MTT.Fanfic@gmail.com !